I have mentioned again and again how easy it is to get married in Virginia if you live in the United States, but did you know it is also very easy to do if you are a resident of the United Kingdom / England? Matt, who lives in England, and Michelle, who lives in Virginia, met and dated during their international travels and decided they wanted to get married. After looking into the process of having a simple wedding in England (hint…there is nothing simple about it), they began researching how to get married here in Virginia. Thankfully they found my website and were able to learn how easy it is to get married in Virginia, even if one of you lives in another country. As long as that country recognizes marriages performed in the United States, all you need is your passport (or US Driver’s License) to obtain your marriage license and I can then marry you anywhere you like in the state of Virginia! Matt and Michelle chose to be married atop the scenic mountain overlook at Bears Den which is only a short 20 minute drive from Winchester, VA. It was a very warm late autumn day and the leaves were just beginning to change colors. I married them in a secluded spot in a very special elopement ceremony (they read some very touching personal vows to one another) and then we spent the rest of the time taking some photos. It was my pleasure to be a part of this wonderful international couple’s wedding day. “Thank you so much! 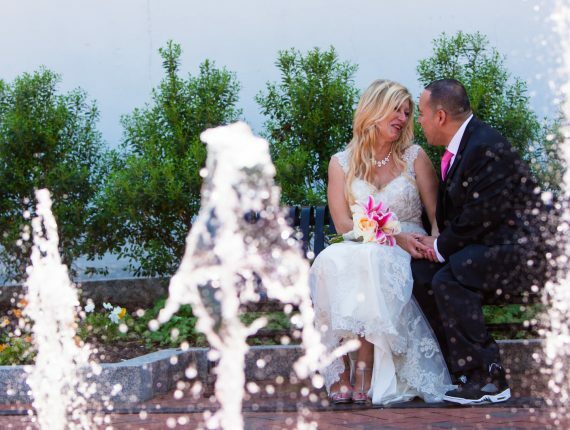 We are looking now after getting home from Charlottesville today and the photos are gorgeous! We are so happy with how they look, you did a wonderful job. Thank you so much again for everything, and for helping us have such wonderful memories of our elopement day! You will have a special place in our life memories :)” – Matthew and Michelle B.